Remember Soda? I do, Charlotte’s skins are some of my favorites in SL, hands down. She had a long hiatus, but now she’s back, and has her store at my stomping ground The Deck. I kept popping in as soon as Sasy told me she was setting up. At that point, she only had The Girl Nextdoor skins from her Persona range set up. So I set up camp until she put up The pinup. Even a single skin is such a bargain as you get 4 different lip versions. That brings the fat pack in at around 32 skins. There is a face for every girl, and any mood you might have. These are hybrid skins, leaning heavier on the hand drawn side, making for a gorgy soft finish. A little bird tells me there will be a release in the not too distant future, but do demo the Persona range, theyre lush. 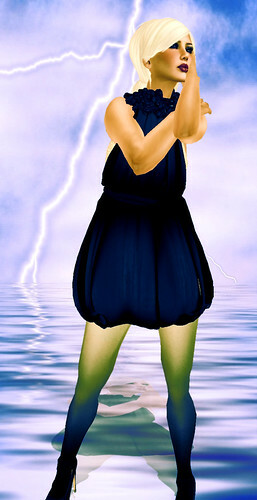 And what better to go with my pinupedness (yes it’s a word :P) than the Sura Suit from Beauty Avatar? And some sparkles on my pics, cos Sasy and I cant stop talking about Ponys that sparkle :P Ash Out. Idiosyncrasy is stoked to be part of SL Daily Deals on the 5th January. 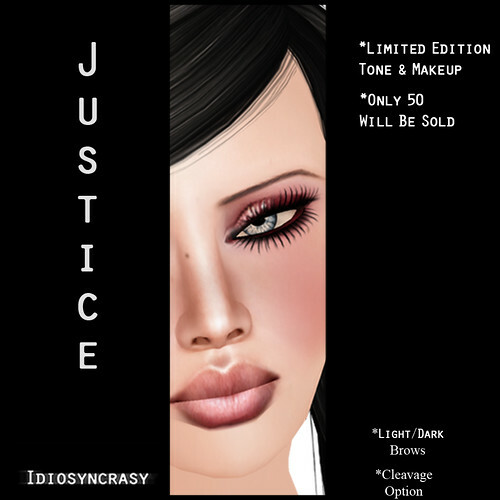 I have a limited edition makeup and tone for the popular Justice skin, limited to 50 copies only at a very reduced price. The demos are up now, but the vendor itself won’t work until midnight tonight. The end of 09 and the start of 2010 has already been amazing design wise. One way I kicked off the New Year was spending up a storm at Ohmai, on her newly released Silouhettes collection. A Silouhette by definition is the emphasis on the outline, rather than the interior, usually backlit, and Anya has taken this concept to the next level with her collection of beautiful pieces. You’ll find black or champagne, or a mixture of both, all of which have a huge impact with their clean lines. Anya is soon moving to a new location, and I’m hoping it will be filled with newness for us all to squee over. You can purchase the entire collection for a discounted price, total bargain btw, and at the moment, it can be found at the Horst location. This store is definitely one to follow this year, I cant wait for more :p Ash Out.